As the weather begins to heat up in Barcelona, you’ll find yourself desperately searching for the nearest bar with air conditioning. 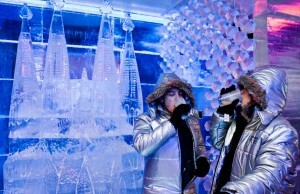 Icebarcelona have gone one better and created an ice bar by the beach, making it the first of its kind in the world! Located on Barceloneta beach, near Port Olímpic, the bar houses some fantastic ice sculptures including the likes of the Sagrada Família. From walking along the sandy shores of Barcelona to entering the bar, you can expect a temperature difference of up to 40 degrees, with temperatures inside reaching around -5°C (20ºF). With good music and the warm company of others, Icebarcelona is the place to be this summer! 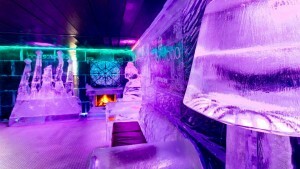 After Dutch entrepreneurs visited Amsterdam’s ice bar back in 2007, they had the unique idea to create an ice bar by the beach – something that had never been attempted before in a climate similar to that of Barcelona. The bar is fully sculpted out of ice. 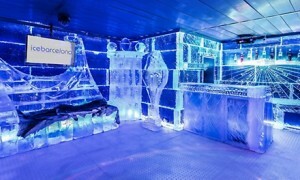 In fact, a massive 25 tons of ice were imported from Belgium to construct the bar. Due to Barcelona’s warm climate, Icebarcelona has to be re-constructed every year, meaning it always keeps a fresh appearance! Amazingly, it only takes the inspiring sculptors, Marc Lepire and Sven Morawietz, just 4 days to re-sculpt the bar. 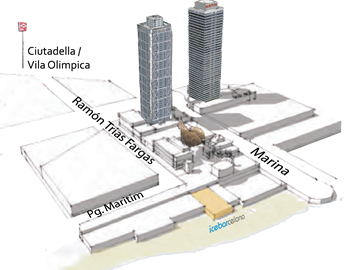 If you soon get tired of the cold, Icebarcelona also have a warm terrace bar overlooking the Mediterranean! You can enter the bar for around 15€ and receive a free drink on arrival, plus a coat and gloves to keep you warm inside. Choose from a range of drinks including cocktails, beer and non-alcoholic choices meaning you can bring the kids along too! The events at Icebarcelona range from weekend parties with DJs to fashion shows and winter/summer balls. They also cater for larger groups with their special packages, including hen and stag packs for the perfect bachelor/bachelorette party! As if all that isn’t enough, they can even hire musicians, photographers, actors or jugglers to make your ice bar experience even more special. 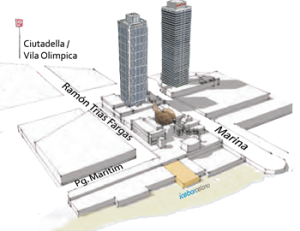 Icebarcelona is located by between the nightclubs Shôko and Pacha, under Passeig Marítim, next to Port Olímpic. This are is renowned for its fantastic nightlife and entertaining beach clubs. Metro: Take the L4 yellow line to Ciutadella | Vila Olímpica. Bus: Lines 36, 45, 59, 71, 92, D20 and V21. This entry was posted in Bars & Nightlife, Home, Places and tagged barcelona activities, Barcelona activities for children, barcelona art, barcelona attractions, barcelona events, barcelona food and drink, barcelona music, barcelona nightlife, barcelona tourist guide, barceloneta, barceloneta beach, summer in barcelona. Bookmark the permalink.